The Appellate Division recently held that the City of Elizabeth (City) and Elizabeth Board of Education (BOE) are immune from liability under the New Jersey Tort Claims Act (TCA) for injuries sustained by a child who was struck by a motor vehicle while crossing the street near a municipal park located about a block away from a public elementary school. According to the appeals court decision in Patrick v. City of Elizabeth, the plaintiff’s failure to prove the existence of a dangerous condition preserved the entities’ immunity under the TCA. A public entity is liable for injury caused by a condition of its property if the plaintiff establishes that the property was in dangerous condition at the time of the injury, that the injury was proximately caused by the dangerous condition, that the dangerous condition created a reasonably foreseeable risk of the kind of injury which was incurred, and that . . . a public entity had actual or constructive notice of the dangerous condition under section 59:4-3 a sufficient time prior to the injury to have taken measures to protect against the dangerous condition. Eight-year-old plaintiff Bryce Patrick was struck by a car while crossing the street at an intersection near Brophy Field in Elizabeth, which is a municipal park that is located approximately a block away from a public elementary school. On the day in question, an unidentified motorist stopped to allow several children to cross the street. As the children were crossing, another motor vehicle passed the stopped car and struck Bryce. There is a “Watch for Children” sign posted on the street on which the cars were driving. Following the accident, Bryce’s mother filed a suit on her son’s behalf against the City and BOE. The complaint alleged the area of the accident was a dangerous condition and there was inadequate signage to warn motorists of the presence of children. In support of the allegations, the plaintiff maintained that because the area involved a school zone, it inherently called for a higher safety standard of care. In addition, plaintiff argued the City failed to follow the national standards for traffic control devices as established by the Manual on Uniform Traffic Control Devices (Traffic Manual). In seeking to dismiss the suit on summary judgement, the City asserted immunities under several sections of the TCA. It further argued that the plaintiff had failed to prove the area was a dangerous condition or that the City had any notice, actual or constructive, of a dangerous condition. The City also argued that N.J.S.A. 59:4-5 provided immunity for a public entity’s failure to provide ordinary traffic signs. The BOE argued that it did not own, control, or maintain the roadway on which the incident had occurred and it was not responsible for the placement of traffic signs. The trial court granted summary judgment in favor of defendants. Regarding the claims against the City, the judge found that plaintiff had failed to provide any proofs of the existence of a dangerous condition. It further held there was no authority presented that a violation of the Traffic Manual would override the immunity granted under the TCA. As for the claims against the BOE, the court agreed that the BOE could not be held liable because it did not control the area nor did it have authority over the signage placed there. The Appellate Division upheld the trial court’s grant of summary judgement. It held that the defendants are entitled to immunity under the TCA. 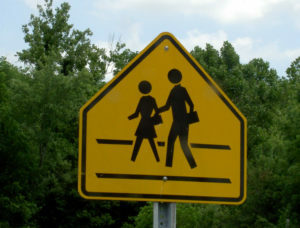 There was no evidence in the record of complaints to the City regarding this area, nor were there any proofs presented to conclude that defendants were palpably unreasonable in not placing additional signage in the area around the school, apart from the children crossing sign that was further down the street closer to the school. The decision of what type of signage and where to place it is within the discretion accorded to a municipality and is immunized under N.J.S.A. 59:2-3(a) [TCA]. With regard to the BOE, the appeals court highlighted that there must be ownership of the pertinent property in order to impose liability under the TCA. “It is undisputed that the BOE did not own the roadway where this accident occurred. It therefore, cannot be held liable for property owned by another entity that contains an allegedly dangerous condition,” the court held. For more information about the court’s decision in Patrick v. City of Elizabeth or the legal issues involved, we encourage you to contact a member of Scarinci Hollenbeck’s Government Law Group.